Sightseers visiting the city will usually have a mental list of attractions to check out, namely the Opera House and the Sydney Harbour Bridge. However, if you have a few days left at the end of your holiday and fancy planning some day trips, then there are plenty of opportunities for an excursion or two, although most outlying attractions will warrant an early morning start. Worth considering is a trip to the Blue Mountains National Park, which comes with a wealth of walking trails, lush tropical undergrowth and superb vantage points. Quite different are the Jenolan Caves, where visitors will learn about the local Aboriginal history whilst enjoying guided tours of the caverns and subterranean rivers. Alternatively, the national parks around the Central Coast may beckon, along with the renowned Hunter Valley Wineries and the tempting sandy beaches lining the Hawkesbury River. 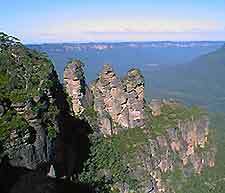 The Blue Mountains are located around 65 km / 40 miles from central Sydney and are part of the Great Dividing Range. With some breathtaking scenery, popular bushwalks, deep gorges, mature gum trees and spectacular scenery, the Blue Mountains get their name from the blue haze surrounding them, which is actually a fine mist of evaporated eucalyptus oil from the trees. Located to the south-west of Katoomba, the limestone Jenolan Caves can be found on the western edge of the Kanangra Boyd National Park and are some of the most famous in the whole of Australia. There are now nine large caverns open to the public and the Jenolan Caves actually rank amongst the most extensive underground networks in the world. The Macquarie Towns area comprises Windsor, Richmond, Castlereagh, Wilberforce and Pitt Town, being established around 200 years ago on fertile agricultural ground, next to the scenic Hawkesbury River. Notable attractions include many historic buildings, the attractive Thompson Square, the Hawkesbury Museum and Tourist Centre, Rouse Hill Estate and numerous local markets. Macarthur Country heads south-west from Sydney and is edged by the Blue Mountains National Park to the west and the coastline to the east. This vast expanse of rolling sheep country includes some of the most historic towns in the area, with rural towns such as Camden, Campelltown, Liverpool and Picton, all of which feature many important buildings, churches, visitor centres and walking trails. Hawkesbury River enters the sea at Broken Bay, around 30 km / 19 miles to the north of Sydney. This mighty river is lined with attractive coves, secluded beaches, numerous picnic spots, walking trails and settlements. 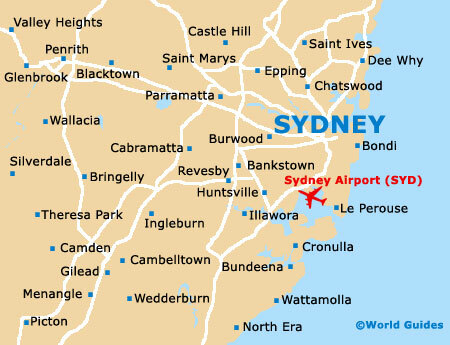 Nearby you will find the Berowra Waters, Cowan Creek, Pitt Water and Brooklyn. The Central Coast is best known for its highly regarded surfing beaches, peaceful lakes, national parks and stunning waterways, such as Broken Bay, Brisbane Water, Tuggerah Lake, Lake Budgewoi, Lake Munmorah and Lake Macquarie. There are a number of small, interesting towns and villages along the Central Coast, such as Patonga - a small fishing village, Pearl Beach - a National trust hamlet, Terrigal - an upmarket coastal town, Copacabana - a small beachfront town, Bateau Bay - close to Wyrrabalong National Park, Toukley - a small fishing town, and Budgewoi - popular for boating. The world-famous Hunter Valley Wineries are within reasonable reach of central Sydney, being roughly two and a half hours away by car. With more than 50 vineyards and family run wineries, including some of the best in Australia, the principal attractions of the Hunter Valley are most concentrated around the small village of Pokolbin, to the north-west of Cessnock. Specific highlights include guided tours of many of the area's very best vineyards, wine tasting and a number of related festivals.